I feel so much better after my visits! My long list of pain & swelling always feels better after adjustments. Ifind myself showing up earlier than my scheduled time in hope that I can be seen & get relief sooner! Always accomidating! I feel so much better after my visits! My long list of pain & swelling always feels better after adjustments. I find myself showing up earlier than my scheduled time inhope that I can be seen & get relief sooner! Always accomidating! This practice is wonderful! Not only are they friendly/extremly heplful, they care about you as a person. The doctor is knowledgableand knows exactly how to help in any situation. They are also flexible when it comes to changing appointments and working with your own schedule. Would highly recommend this practice. This practice is wonderful! Not only are they friendly/extremly heplful, they care about you as a person. The doctor is knowledgable and knows exactly how to help in any situation.They are also flexible when it comes to changing appointments and working with your own schedule. Would highly recommend this practice. 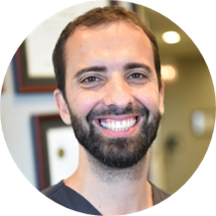 A qualified professional, Dr. Daniel Dierdorff graduated from Life University, where he received his doctoral degree in chiropractic medicine. He is an active member of the Georgia Chiropractic Association and constantly keeps himself up-to-date on the most progressive techniques available. Serving the locals in and around Sandy Springs, GA, Dr. Dierdorff is a skilled chiropractor. Running a private practice, he provides thorough medical care for the treatment of a host of conditions related to the musculoskeletal system. Dr. Dierdorff believes in providing his patients with all the information they need to make educated decisions about their health care. He gives them his undivided attention and practices with the goal of helping each of them lead healthy and fulfilling lives. Outside of his clinical career, he enjoys exercising, rock climbing, and spending time with family. Dr. Dan is amazing! When I initially started my treatments, I was in horrible condition. My range of motion is so much better. Everyone on the staff is friendly and they are so professional. I'd recommend anyone looking to improve theirlifestyle (looking to be pain free) to visit Dr. Dan.! Dr. Dan is good I'm feeling alot better then when I first came. Very professional staff no long wait and effective. I feel a friendly, caring, helpful when I come to my appointments. The office has a clean, comfortable environment. Staff are pleasant and interested in my feelings and pain. Dr Daniel is fantastic person and caring to my pain needs. Great visit. Thorough adjustments, always provides feedback on progression, and asks about pain level. Very personable as well and really cares about his patients. Would highly recommend! Within a week of adjustments, my neck pain was gone. My visit is alway warm & comfortable from the time you walk in they make you feel like you belong. Very prompt never have to really wait to be seen. Love Dr. Dan he's very affective.